Going on nature, it is necessary to remember about security. In the thick grass and low branches of trees, you wait ticks that can be carriers of deadly diseases. 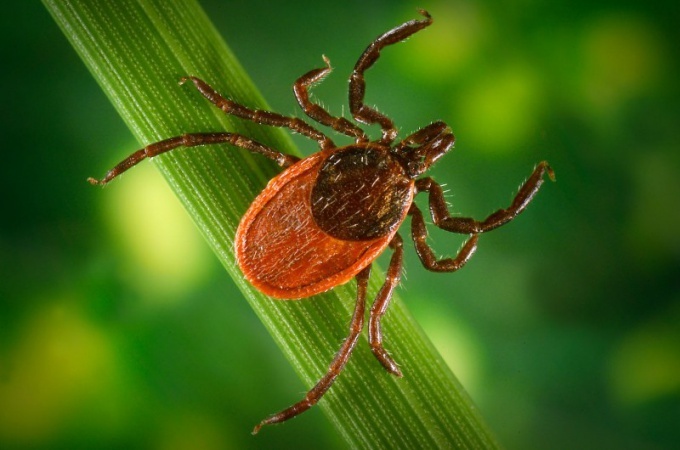 Even short-term tick bite could become infected. Tick-borne encephalitis is characterized by symptoms of intoxication and fever. The virus frequently affects the Central and peripheral nervous system. The acute form of the disease can lead to paralysis and death. The symptoms of tick-borne encephalitis is not apparent immediately. The incubation period averages 7 to 14 days. Develops body aches, muscle weakness, numbness of the skin of the face and neck, flu-like condition. The temperature may be increased to 38-40 degrees. The person feels malaise, can feel a sharp headache, may cause nausea and vomiting. If you suspect a tick-borne encephalitis should seek medical assistance in the infectious diseases Department. Lyme borreliosis, or Lyme disease, is caused by the bacteria group Borrelia burgdorferi. Foci of Lyme borreliosis in nature coincide with the habitat of ticks. The incidence is also seasonal in nature and depends on the tick activity. The most noticeable and common symptom of Lyme disease – local redness at the bite area that appeared not earlier than a week. Gradually, the erythema increases in size and can reach several tens of centimeters in diameter. However immediately arose in the time of the bite redness says more about a simple reaction to the tick bite than the infection. Allergic redness passes quickly, whereas Borrelia erythema will only increase. Lyme disease possible symptom of intoxication accompanying the erythema. It appears low-grade fever, headache, chills, fatigue and body aches. After 3-4 weeks the redness may subside, but keep in mind that untreated infection disseminatum throughout the body. Can affect the organs of the nervous and cardiovascular systems. In the chronic form of borreliosis manifested by skin lesions and joints. At a later stage to treat the infection is very difficult, so early diagnosis is important. Early in the disease the Borrelia bacteria is sensitive to antibiotics. The sooner you start treatment, the better the chances of full recovery, no complications, and prevention of chronicity. It is important still, as soon as possible to remove the tick. Preventive vaccine against borreliosis does not exist. To protect themselves from potentially dangerous ticks, going to the woods, wear maximally closed clothes, high shoes and a hat. Use chemicals, frightening off of pincers. Upon return, carefully inspect themselves for the presence of parasites. If you still find mites on the body, carefully remove it using tweezers, surgical clip, a special device or a simple thread. Because the symptoms of these terrible diseases do not appear immediately, it is advisable to test the tick for carriers of infection. For this you need to take it to a virological laboratory. After removing the tick, place it in a glass container with a tight lid, and put dampened cotton wool. Enclosed bottle keep in the fridge, if you can not deliver it to the laboratory immediately. To conduct the microscopic diagnosis of the tick should be alive. PCR diagnostics may use fragments of the parasitic animal, but this method is not very common. Give blood tests to determine the presence of the disease. Directly after the bite tests, of course, will show nothing. After 10 days of possible PCR blood testing for encephalitis and Lyme disease. Two weeks later revealed antibodies to tick-borne encephalitis virus. Antibodies to Borrelia can be detected only after a month.